TRU Group White Paper Aerospace & Manufacturing Summit Panel Notes Link — "Distribution Strategy - Criteria and Rules Expand your Sales In-house Sales Force, Distributors, or Export?" "Expand Your Sales: In-house Sales Force? Distributors? Export?" What's the best way to reach new customers and new markets with your product or service? What about selling outside the US? Learn more about ways to grow though an in-house sales force, distributor partnerships, or overseas exporting! The US is ranked first as the global leader in aerospace production and Arizona is in the top three states for aerospace manufacturing capability.. Aerospace products are Arizona's number three export, at over $1.6 billion in 2004. 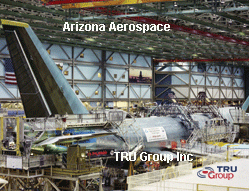 Arizona is ranked in the top 10 as an exporter of aerospace products and services. Arizona boasts sunny weather year round, perfect for flying any type of aircraft. Arizona's top-ranked research universities and other R&D establishments employ over 100 researchers developing new technologies in the aerospace, IT, semiconductor, and electronics sectors. Arizona is ranked 9th nationally with high tech companies employing more than 108,000 workers at an average wage of $63,000. Arizona's defense electronics manufacturing employs more than 5,000 workers, ranking 7th nationally. Arizona ranked fifth in the nation for Department of Defense contracts in 2002. More than 1,200 Arizona companies and agencies benefited from military contracts, with the largest awards going to avionics and defense related businesses. TRU Group Inc President & CEO. For more than fifteen years, Edward Anderson has successfully managed many TRU Group international assignments involving investment decisions of hundreds of millions of dollars. He is an expert manufacturing & industrial company analyst and planner. He has assisted start-ups to grow exponentially and obtain the financing to do so. He has several years Vice President Operations at a Tucson, AZ photonics component manufacturer and Director level experience in North American middle-market technology-intensive multinationals. He has worked for prestigious engineering and multi-billion-dollar investment firms. He taught business at the Universities of Arizona and Toronto.